Most everyone has traveled for a while when they first see the miraculous lake in the desert, Mono, from a high entrance, Conway, Tioga or Deadman Passes. 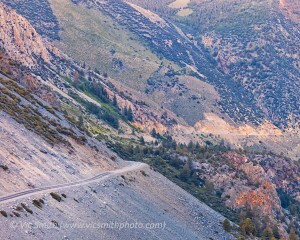 I’ve been traveling for 9 hours when I cross over Deadman Pass and start the descent into the Mono Basin. I’ve come from my home in the Arizona mountains down to the desert and then back up into the mountains. I’ve dropped from cool pines down to the open creosote and earthtone hills and ragged washes of the Mojave Desert and then up to the not-quite-so-hot sagebrush and tree ghosts of the Owens Valley and then once again into pines around Mammoth Lakes. I’ve done this trip enough that my coping with its length is standardized. I look for evidence of change, closings, fallings and the eternal hope of new things. I imagine stories of folks on these roads looking for the good life in the agricultural bounty of the Golden State, of folks looking for the lucky strike, the vein of mineral, laboring in a cave with a pick and shovel or hauling rocks in carts, traveling up and down rocky roads most folks wouldn’t even attempt. I think of folks who came to a verdant Owens Valley, full of mountain water, only to have it pirated south, their treasure sacked by those in charge in order to aggrandize the powerful in a distant basin. These imaginings mix with vague memories of these places from my childhood, on the way from Southern California to Seattle to see my father’s family. 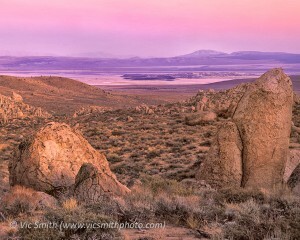 We would leave during the night and drove along the eastern Sierra crest as the morning light started to warm the gray walls rising from the desert floor. We were in our gray Plymouth station wagon, my brother and I laying back feeling the hot desert air blowing in the open windows while we looked up at the crest. We had no sense then of how high it was or how much energy would be required to ascend it. Today, as the sun angles down toward the crest, my goal is near and my anticipation is growing. The lake in its basin is intermittently visible in the distance. Around it on the east are low mountains, hills and volcanic domes. In the other direction are the crags of the Sierras. 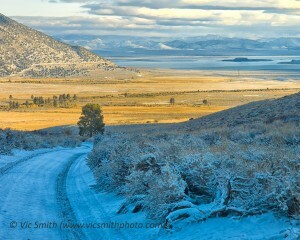 Sagebrush runs up to pine stands in both directions. I am once again approaching this magical world of many faces, this land where the bounty and the relentlessness of our earth is manifest, where good things flow down and other good things fly up. I’ve seen the Mono Basin in many costumes, filled with smoke, with brilliant crisp sunlight, with sunrise and with sunset light glowing down, and with snow and ice everywhere. I’ve known its human inhabitants and seen its human artifacts, highways and roads, the traces of the aqueduct taking water south, dust from a materials site, scattered houses, ranch remnants and, around the corner, a small town. I’ve seen how it inspires a hardscrabble survival response. Because it is the place where the Great Basin Desert meets the peaks of the Sierra crest, the sparse human artifacts are dwarfed. But its scale is always huge and its magic infectious to those who enter. Entrances are mostly down, some steeply, exciting the senses. I am here to be outside, so I stop, exit my nature-proof vehicle and stand above the basin. I want to be in the distances, stand by the lake, feel the breeze, smell the fragrances, especially the sagebrush, and hear the rushing water of creeks and the rustlings of birds, lizards and branches. From this vantage point, the peaks and the basin are equally large and equally magnificent and belong together. Majestic high places receive great veneration but this basin is equally magnificent. Mono brings both into harmony with the other. After giving thanks, I proceed down the hill into the magical world. This entry was posted in Images, Places, Words and tagged MonoBasin. Bookmark the permalink. I’m wondering if you would be open to me passing this along to our social media folks to share on the Committee’s[MonoLakeCommittee] Facebook and Twitter feeds?